Tassels usually embellish crocheted pieces like shawls, hats, and ties. Rather than working tassels directly into a crochet stitch (as with fringe), you make tassels separately and then attach them to the design. 1Cut a piece of cardboard the same width as your desired tassel length. If you’re following a pattern, the instructions specify what size to cut the cardboard. 2Wrap the yarn several times around the piece of cardboard. 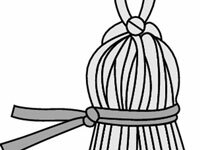 The more times you wrap the yarn around, the fuller your tassel will be. Be sure not to pull and stretch the yarn as you wrap. 3Tie the yarn bundle together at one end with a separate length of yarn. This separate length of yarn should be at least 6 inches in length, long enough to tie the bundle together and then tie the tassel to the piece when complete. 4Slide the bundle of yarn off the cardboard piece, wrap another length of yarn 2 or 3 times around the bundle below the tied end, and tie in a knot to secure. 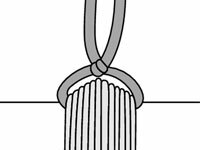 This step shapes the tassel. 5Cut the loops on the opposite end of the bundle from the tied end, then trim the ends of the tassel so they’re even. 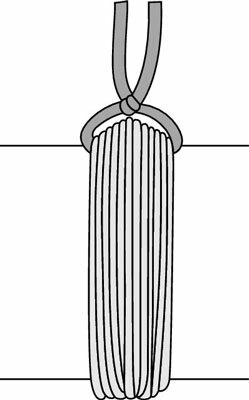 With the top tie’s remaining yarn, attach the tassel to the designated spot. Attaching a tassel is the same, no matter what you’re attaching it to. If it’s the back point on a bandana, then the stitch on the very end will hold the knot. If you’re attaching tassels across the edges of a scarf, then the instructions will designate which stitches to tie them to (for example, every other stitch or every third stitch).